Elizabeth Smith is an accomplished public relations and brand experience specialist with 8 years of professional experience in strategic communications for top-tier Canadian associations. Elizabeth joined HAC in the fall of 2017 to bolster digital communications and ensure the industry is represented with a strong and engaged voice, with a focus on strengthening member communications and building a strong external brand for the association. 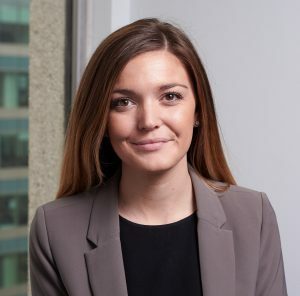 Most recently, Elizabeth served as the Manager of Communications at Fertilizer Canada – a national industry association – where she led a comprehensive corporate rebranding effort and overhauled the organization’s communications and marketing activities. Elizabeth holds a Bachelor of Arts from the University of Ottawa and a diploma specializing in public relations from Algonquin College. During her time as a student, Elizabeth led a fundraising campaign that raised over $10,000 for the International Charity for Africa, a charitable organization that delivers community-level poverty alleviation support through small enterprise economic development.